As stunning as the entire California coast is, Big Sur stands out. The word “majestic” often gets tossed around when referring to the region, likely due to its atmospheric redwood groves and soul-stirring views of the Pacific. Plus, its storied past as a haven for beatniks and literary figures such as Henry Miller and Jack Kerouac has helped foster an ongoing bohemian spirit. Today, nature seekers and modern day hippies will discover more than a place to rest their heads. 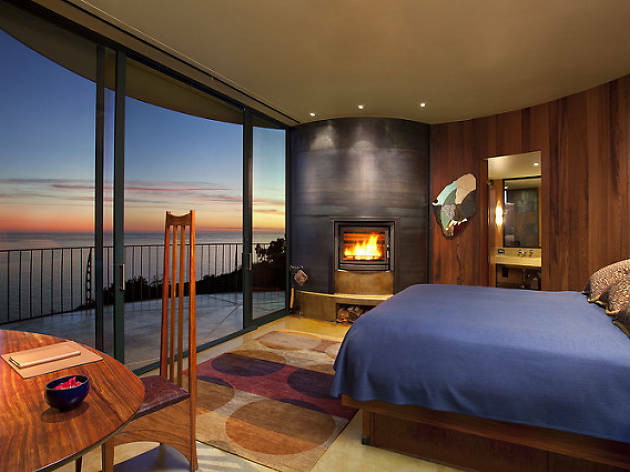 Local inns and resorts have incorporated creative ways for visitors to connect with Big Sur’s spectacular natural surroundings and relaxed pace; it’s little wonder most properties dispense with TVs given the grand-scale splendor and serenity awaiting just outside your door. There’s much to love about this former roadside motel that’s been reimagined as a rustic-chic escape with mid-century touches and indoor-outdoor fireplaces. Guest rooms eschew TVs for yoga mats, vintage board games and Buddha Boards—canvas boards for drawing with water-dipped paint brushes. 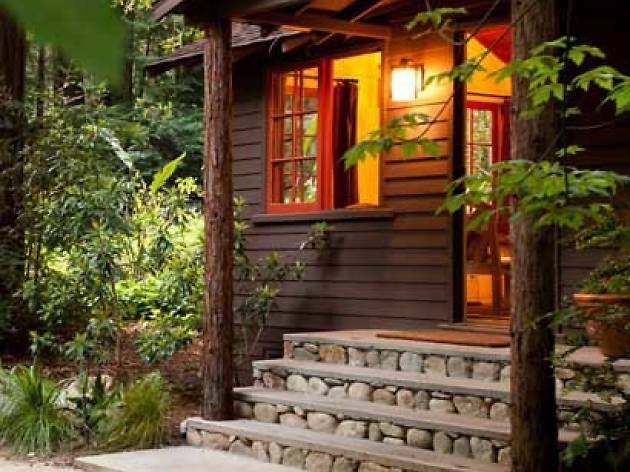 Across Highway 1, a cluster of cabins tucked into a redwood forest along the Big Sur River feature added amenities such as private patios with outdoor soaking tubs. Glen Oaks’ restaurant, the Big Sur Roadhouse, is one of the better eateries in town dishing up solid takes on hearty breakfast and lunch dishes including chilaquiles and a BBQ pulled pork sandwich. At night, grab a Faribault Woolen Mill Co. wool blanket and snuggle up around one of the outdoor fire pits. Time Out tip: Make sure to follow the onsite nature trail that winds through the property’s 20 acres, dipping into a redwood grove and meandering along the Big Sur River before leading to a pair of small, sandy beaches. With much of its humble 1930s character intact, Deetjen’s quickly recalibrates your body to Big Sur’s gentle pace. A serene atmosphere pervades, so you can forget about WiFi or cell service. The rustic rooms and cabins wouldn’t be mistaken for the Ritz—and the thin walls in the older building may not be for everyone—but this place has romance for days. 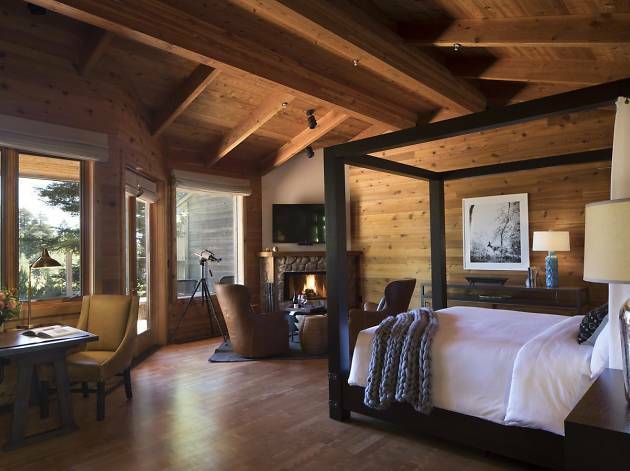 Tucked into a redwood forest, guest rooms feature comfy furnishings including linen duvet covers and wood-burning stoves. The inn is also the site of the most charming restaurant along the California coast with a trio of cozy, wood-paneled dining rooms adorned with vintage bric-a-brac and warmed by a crackling stone hearth. Get the soul-satisfying blueberry pancakes, huevos rancheros or anything with house-cured salmon. Time Out tip: Seek out the quiet grotto-like area at the rear of the property, where you can sit with a book and enjoy the ripple of a small cascading waterfall. With paradise-like grounds perched 1,200 feet above the Pacific Ocean, this might be as close to heaven as hotels get. Post Ranch is famous for striking, modern architecture melded seamlessly with its forested, natural environs. No TVs or alarm clocks here; instead, 39 unique rooms, suites and treehouses feature wood-burning fireplaces, spa tubs and private decks with knock-out vistas. A complimentary mini bar is stocked with healthful, wine-friendly snacks to pair with your half bottles of red and white. Everything here is geared toward the gobsmacking ocean views. If you can pull yourself from your room, Sierra Mar restaurant features a wall of glass windows and an outdoor patio with vistas that rival those of small aircraft. Better yet, submerge yourself in one of two cliff-top infinity pools and gaze out over the Pacific. Time Out tip: Big Sur has much to explore, but we wouldn’t fault you if you never stepped foot outside the resort. If you need to stretch your legs, seek out the hidden hammocks scattered throughout the property and appreciate the once-in-a-lifetime setting—and expense. Built in 1975 by the producer of the counterculture flick Easy Rider, this expansive property has seen its share of renovations and rebranding over the years, the most recent being in late 2017. Yet, the soulful vibes remain the same thanks in part to the weathered cedar architecture resting among mature oak and redwood trees. 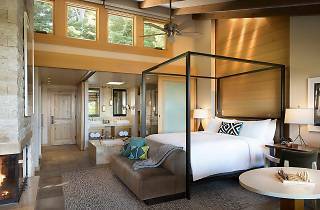 Modern rooms feature clean lines and earth tones, but you’ll want to luxuriate with some of the many amenities scattered throughout the 160-acre property. Nibble frozen fruit on day beds surrounding the Meadow Pool or go 1970s-era Big Sur at the clothing-optional Mountain Pool. Soak in the spa’s outdoor tubs or kick back in the 60s lodge-like Social House which features billiards, complimentary wine and vinyl records to spin. Ventana’s signature restaurant, Sur House, features a menu of locally-sourced dishes with many ingredients plucked from the resort’s organic garden, yet it’s the endless ocean vistas from the landscaped dining terrace that will leave you dazzled. Time Out tip: Don’t lock yourself in your room at night. Hit up the resort’s co-ed Japanese hot-baths which are open 24 hours and feature mind-blowing stargazing. 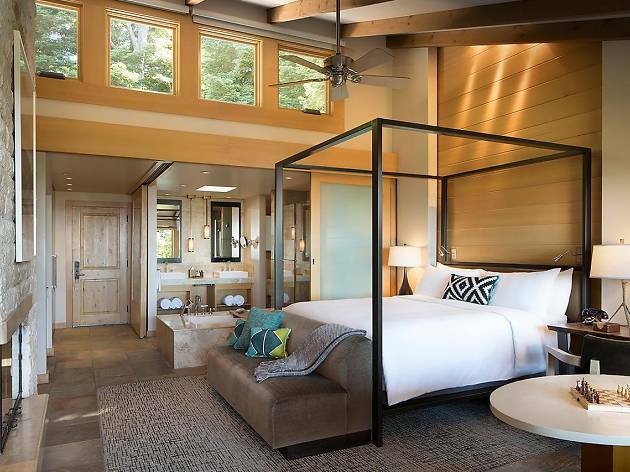 Situated in a redwood-filled canyon immediately adjacent to Ventana Big Sur resort, this modern campsite features 15 safari-style canvas tents outfitted as outdoor, camp-themed hotel rooms. You’ll want for nothing with luxury linens, plush mattresses and power bricks with electrical outlets and USB plugs. A fully-stocked bath basket with towels and shower amenities makes the short walk to the nearby, modern Bath House worth it. And when the sun dips, you can grab a lantern, uncork a bottle of wine and cozy up around your wood-burning fire pit. In the morning, happy campers wake to fresh pastries and coffee dished up at a central welcome tent. Time Out tip: Kick in an additional $100, and you’ll enjoy all the amenities—pools, spa, fitness center, Social House—of the neighboring Ventana resort. 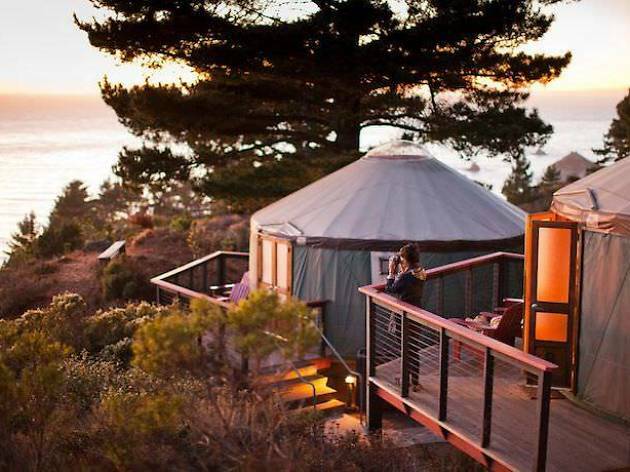 At the southern end of the Big Sur coast, roughly 30 miles south of Big Sur village, Treebones features 16 yurts scattered among secluded coastal cliffs overlooking the Pacific. The large, round fabric tents feature plush queen beds, heating, electricity, hot water sinks and polished pine wood floors. You’ll still have to walk to a nearby restroom, but you’ll hardly mind when you’re enjoying the spectacular coastal views from the Adirondack chairs on your spacious redwood deck. Don’t want to stumble outside to the bathroom at 9pm? Book the Insta-worthy Autonomous Tent, a secluded cocoon-like structure that features all the perks of a luxury hotel room including a private bathroom and shower powered by its own solar array. Given the property’s blissfully remote locale, you’ll likely eat the upscale “campfire cuisine”—bison burgers, kale pesto spaghetti—at the property’s Wild Coast restaurant, or be treated to a proper omakase dinner at the surprisingly good sushi bar (reservations required). Time Out tip: For a unique—and weather dependent—experience, you and a pal can spend the night in the Human Nest or hobbit-like Twig House, two sculptural, wood-woven structures that are exposed to the elements, crafted by local artist Jayson Fann. 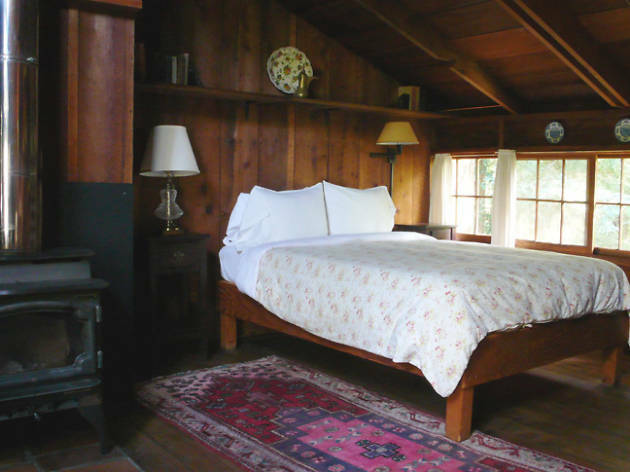 Though there are no actual lodge rooms, a series of pleasantly surprising cottage-like guest rooms are a welcome opportunity to stay in beautiful Pfeiffer Big Sur State Park. Renovated in 2017, room interiors are simple but tasteful with many featuring huge, wood-burning stone fireplaces (with wood delivered directly to your room). 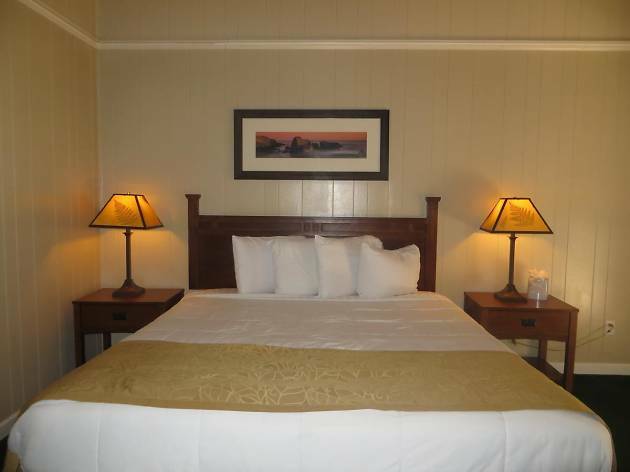 You’re easy walking distance from both the pebble-lined Big Sur River and trailheads of the park’s many hikes. So, where’s the actual lodge? It’s a central building with a decent lobby lounge and a handy general store. There’s also a restaurant and cafe that works if you’re in a pinch, but you’ll find better dining options outside of the park. Time Out tip: The property features a seasonal pool, but when temps heat up, head to the Big Sur River Gorge located at the far southwest corner of the park’s campground. The hidden spot features deep, crystal-clear pools for wading, and massive boulders to stretch out and dry off under sunny blue skies.